Disciple: N was puzzled about time and space because it is not clear whether time and space are properties of matter. You can see that time and space both are not the same for man every time. When your mind travels from Calcutta to London it is not in the material space and not in the time that you feel with the outer mind. It is in the mind itself that you move. Space also is a movement of the Brahman inasmuch as it is an extension, but there is a difference as far as time is concerned. Disciple: We are conscious of the movement of Brahman as time because we live from moment to moment and we can feel time only by events. So also the world is an extension. Sri Aurobindo: In that way everything is an extension- expression, projection, manifestation, -of the Brahman. It is only a way of saying. Disciple: Some say that time does not exist al all. Sri Aurobindo: Who says it? It depends upon the point of view and state of consciousness from which you say it, i.e. whether one says it only intellectually, or from an experience. Disciple: Time may not exist in a consciousness where the universe does not exist. Sri Aurobindo: Quite so. Disciple:The scientists define gravitation as only a curvature of space – and, as we know matter only by weight, matter is curvature of space. Sri Aurobindo: But what about matter being the same as energy? Disciple: Einstein admits their identity and says that energy has weight. Disciple: How can energy have weight? Disciple: If you wound your watch and unwound it – there would be a difference in the weight? (laughter). Sri Aurobindo: “Nothing” means what? Does it mean non-existence, or nothing that we can, or do, sense? If you say it is non-existence then nothing can pass through it; you empty a tube or a vessel of the air or gas it contains and say it is a vacuum. But how do you know there is nothing in it? Disciple: If there was anything in it, there would be resistance. Sri Aurobindo: Why should you assume that everything must offer resistance? If ‘nothing’ means non-existence then if anything enters non-existence it becomes non-existence. If you enter non-existence you cease to be. A ray can only arrive at nowhere through nothing. Disciple: That may be occult knowledge. 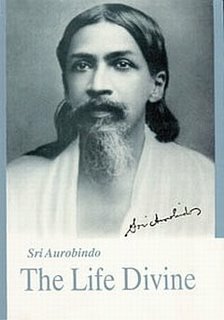 Sri Aurobindo: It is not merely occult knowledge but occult knowledge and common sense. Sri Aurobindo: The question remains: either it is a conception or any entity. If it is a conception only, then your observations can also be only conceptions, that is to say, they happen in you only. Then you come to Mayavada: nothing but you exist. Disciple: The latest idea is that space is curved. Sri Aurobindo: What is the meaning of space being curved? Einstein speaks of curvature of space round the Sun and when a body gets near it it goes down the curve. But the question is: what is that curve and in what does it exist? For instance, some say the universe is expanding. In what? There must be something in which it is expanding. And why is a ray of light deflected in the sun’s neighbourhood? You say: because there is a curve. But why is there a curve? And in what is that curve? And then, what is expanding? Is it Matter? You will say: no. Then Energy? You say: yes. But the energy is expanding into what? You say space is bent: the question is, is matter bent or space? Disciple: The amount of Matter in the universe is limited-it is finite. Matter has weight and the weight of all matter is known. Sri Aurobindo: But what is matter? Is it a wave or a particle? Disciple: According to the quantum theory it is a particle which is matter and energy at the same time. Sri Aurobindo: If you say that matter is finite then there must be some medium which supports matter and which is infinite. You say matter has weight.-what is weight? Disciple: Some of the scientists say that the sun is losing weight at a certain rate and the time when it will be exhausted is calculated! Sri Aurobindo: How do you know that the sun is not renewing its weight? Disciple: What else can science do? It must take the data and make a hypothesis. ii. Then you should draw the right inference. The difficulty is that you can never be sure of having all the data for any phenomenon. Disciple: There are so many calculations: earth’s age, the rate of the expanding universe, the sun’s birth, the age of the sun etc. Sri Aurobindo: I sympathise with Shaw who says: “they don’t know what it really is.” Something escapes from their calculations like the fish from the fisherman’s net.